Watch the UFC 186: Johnson vs. Horiguchi on April 25, 2015, at the Bell Centre in Montreal, Quebec, Canada. UFC 186 is set to go down in Montreal tonight with a title fight on top. 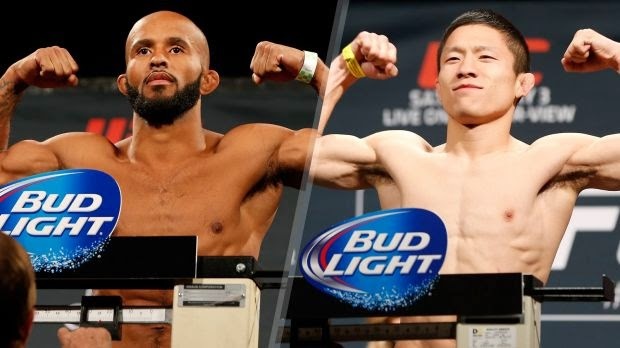 UFC flyweight champion Demetrious Johnson will look to defend his title for a sixth time when he takes on young Japanese fighter Kyoji Horiguchi in the main event of the pay-per-view. We'll cover all the preliminary card action in this post. The Fight Pass portion of the card kicks off at 6:30pm ET/3:30pm PT, then the broadcast moves over to FS1 for the rest of the prelims at 8pm ET/5pm PT. The featured preliminary card bout takes place in the welterweight division, with hometown boy Patrick Cote taking on veteran Joe Riggs. The rest of the prelims are also heavy on local Canadian talent. Jump up ^ For the UFC Flyweight Championship.